Google launched an extensions gallery for Google Chrome and added support for extensions in Chrome 4 Beta (Windows and Linux only). 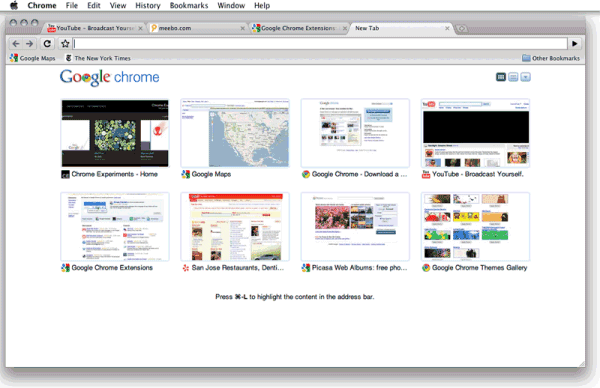 Google also released the first beta version of Chrome for Mac, but it doesn't have support for extensions. The extensions gallery includes 371 extensions. You shouldn't expect to find complex extensions, toolbars, download managers: Chrome extensions are lightweight, they have a minimalistic interface and few of them are customizable. There's a Gmail extension that displays the number of unread messages from your inbox, an extension that lets you subscribe to feeds, a Google Reader notifier, a Google News button, an ad-blocker, a Google Tasks button, extensions for StumbleUpon, Picnik, eBay, WOT, Twitter and Facebook. Most extensions add small icons next to the address bar so you can perform certain actions by clicking on the icon. 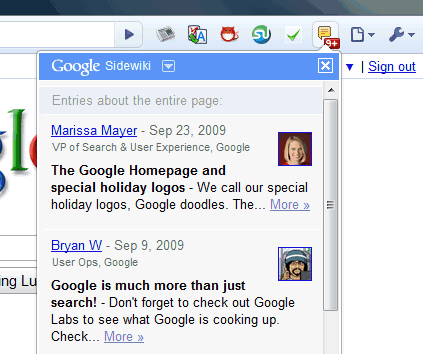 They're similar to Google Toolbar's buttons, but Google Chrome's extensions can also modify web pages. The browser has built-in support for Greasemonkey scripts and many extensions are obtained from bookmarklets and user scripts. "We wanted to make extensions easy to create and maintain, while preserving Google Chrome's speed and stability. Extensions on Google Chrome accomplishes all these goals: they are as easy to create as web pages, easy to install, and each extension runs in its own process to avoid crashing or significantly slowing down the browser," explains Google. 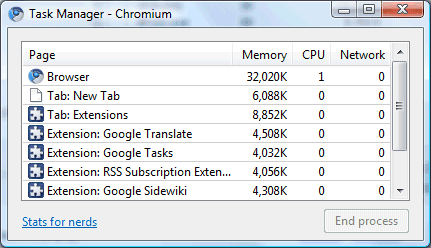 In Google Chrome, you don't have to restart the browser to install an extension or to disable an extension. The first beta version of Google Chrome for Mac doesn't include all the features that are available in the Windows version, at least not yet. "In bringing the Mac version of Google Chrome from its developer stages to a beta standard, we returned to the core principles of the Chromium project and focused on delivering rock-solid depth in a few critical areas for the browser, rather than a breadth of features that are rough around the edges. This first beta release for Mac does not yet incorporate extensions, bookmark sync, bookmark manager, and cookie manager," mentions Google. The Linux version is more mature and it includes support for extensions. "At Google, most engineers use Linux machines, so we certainly heard loud and clear how much they wanted Google Chrome for Linux. Just like Google Chrome for Windows and Mac, we focused on speed, stability and security, but we also wanted a high-performance browser that integrated well with the Linux ecosystem. This includes tight integration with native GTK themes, updates that are managed by the standard system package manager, and many other features that fit in natively with the operating system where possible." Do you have any information about extensions not working in incognito mode? I've just noticed Extensions are disabled in Incognito mode on purpose. The menu option under Tools is "greyed out". I'm wondering why did they do that. Is there any hope that it will be enabled any time soon? Well, chrome has no control over what extensions do so I suppose they can't guarantee your privacy in Incognito mode with extensions enabled. I also thought not being able to guarantee privacy is the reason why they decided to disable extensions in Incognito mode, but then I checked Firefox and guess what? They have add-ons enabled in Private Browsing mode. So I'm just wondering if that's the real reason or just some other technical one. Also, if Mozilla can guarantee privacy in this situation, why can't Google? Aren't Chrome extensions being checked by anyone (the community or Google) for malicious code? "For the record, the issue is that we're not sure what it should mean to install extensions in incognito mode. Do you get the same extensions in incognito mode that you had in normal mode, or is it a different set? If they are the same, are they limited in anyway as to what they can store, or is it up to them to do the right thing? If it's up to them, how do they even know that they are in incognito mode?" Once the chrome has started to break down, you really don't have any choice. Have you tried angle hair or .000 steel wool with polishing compound? I've used this in the past with very good results. Follow this with a good quality wax.